Strawberry Cupcakes with Fresh Strawberry Buttercream are basically summer in cupcake form. They’re fresh and sweet and they showcase fresh strawberries, the most quintessentially summer fruit! If you like cupcakes, or cake, or dessert (and who doesn’t, really?) then you’re definitely going to love this easy cupcakes recipe! 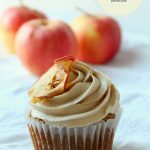 Looking for more easy cupcakes recipes? 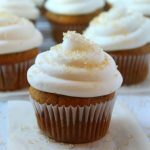 Bake up some Dairy-Free Coconut Lime Cupcakes or a batch of delicious Peppermint Chocolate Cupcakes! 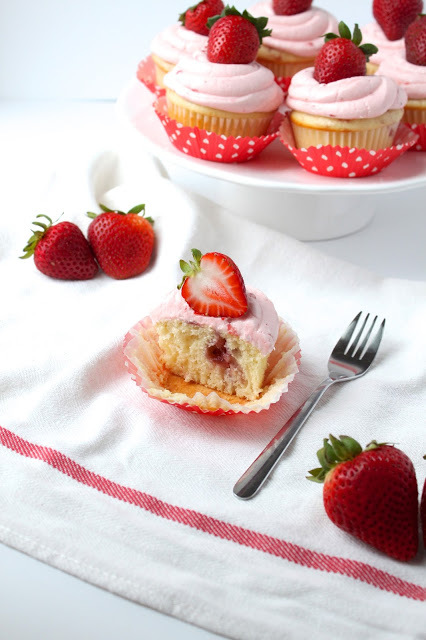 The base for this easy cupcakes recipe is Chef Anna Olson’s Fluffy Vanilla Cupcakes, but I’ve made it my own and strawberry-ified it! The recipe is here, but you can get a printable version at the bottom of this post. 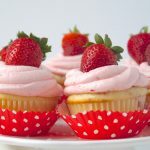 To make these delicious strawberry cupcakes with strawberry buttercream, start by preheating your oven to 350 degrees Fahrenheit and lining your cupcake or muffin tins with 18 paper liners of your choice. 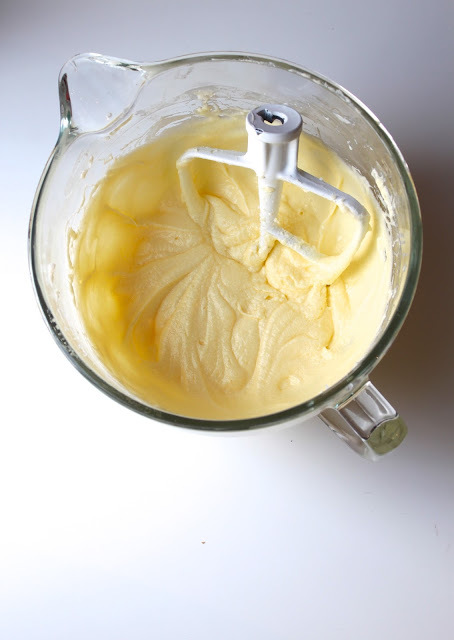 Next, start preparing the cupcake batter by adding the butter and white sugar to the bowl of your stand mixer. Beat these ingredients together on medium-high speed for several minutes until the mixture becomes light, fluffy and pale in colour. Beat in each of the 5 eggs, one at a time, on medium speed. It’s a good idea to stop between each addition to scrape down the sides and the bottom of the bowl, just to make sure everything is incorporated evenly. Measure the flour, baking powder and sea salt into a separate bowl and set it aside. Measure out the milk and add the vanilla to it. You’re going to add the dry and wet ingredients alternately here, starting and ending with the dry ingredients. 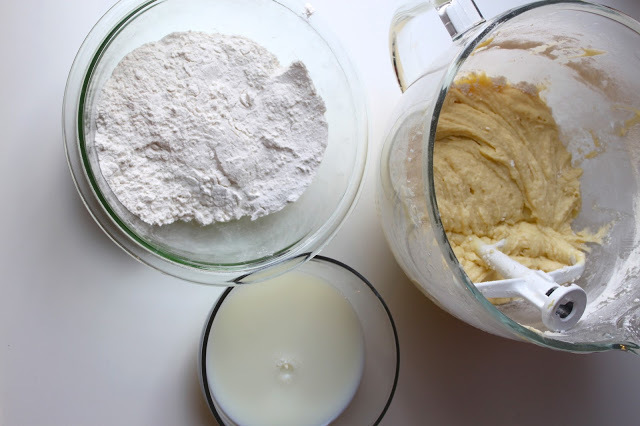 The best way to do this is to roughly divide the flour mixture into thirds and the milk mixture in half. Add one-third of the flour mixture first, then one-half of the milk mixture, another third of the flour mixture, and so on. Add these ingredients on the lowest speed and be very careful not to over mix…only let the mixer run until the ingredients are just combined. When you make the last addition of dry ingredients it’s actually a good idea to do this by hand with a rubber spatula just to prevent over mixing, which leads to a tough and dense crumb. 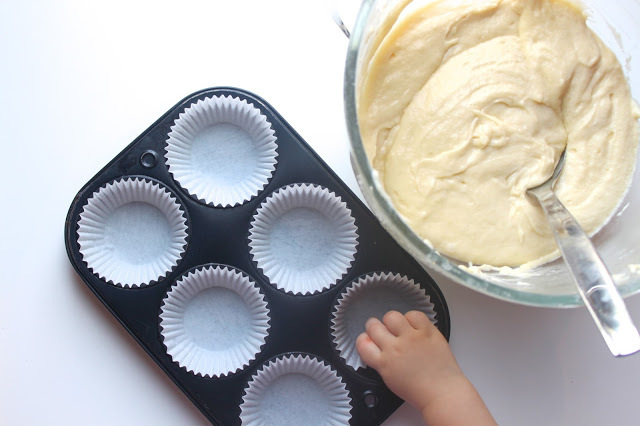 Once everything is combined, try to prevent your toddler from stealing your paper cupcake liners as you divide the batter evenly between all 18 of them. They should each be about 3/4 full. After you’ve divided the batter measure out one teaspoon of strawberry jam onto the top of each cupcake. Pop the cupcakes in the oven for about 18-20 minutes (at 350 degrees Fahrenheit). 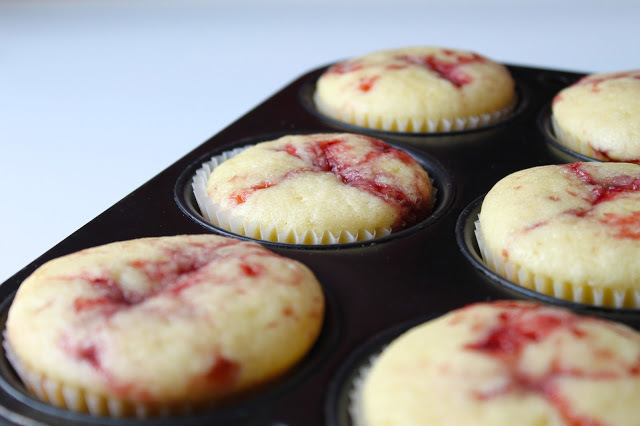 Remove the strawberry cupcakes from the pan and let them cool on a wire rack until they’ve cooled completely. While you’re waiting for the strawberry cupcakes to cool you can begin to prepare the frosting, starting with the fresh strawberries. Chop about 5 or 6 strawberries as finely as you can. You’ll need to add 1/2 cup chopped fresh strawberries to the frosting but it’s a good idea to drain as much liquid out of them first. Once they’ve been chopped add them to a strainer over a bowl to let the excess liquid drain out of them while you prepare the rest of the frosting. Add the butter and 4 cups of icing sugar to the bowl of your stand mixer, along with the milk. It’s a good idea for the butter to be just slightly cooler than room temperature for this frosting because of the high water-content in the strawberries. 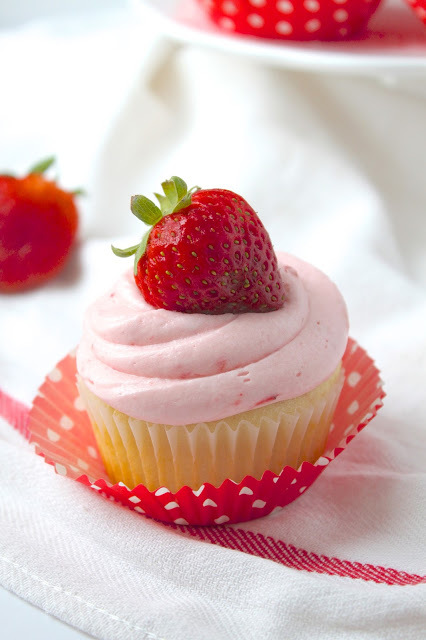 Having the butter just slightly cooler will create a frosting that’s a little more stiff than is usually ideal for cupcakes, but once the strawberries are added it will soften beautifully. Beat the butter, icing sugar and milk on high speed until you end up with a stiff buttercream frosting. You’ll probably have to scrape down the sides of the bowl a few times to make sure everything is incorporated. Remember those strawberries that are draining? Measure out 1/2 cup and add them to the stiff frosting. Beat them in on medium speed, scraping down the sides of the bowl to make sure everything is evenly incorporated. At this point you’ll probably be left with a frosting that’s too soft to pipe, so add as much of the remaining 2 1/2 cups of icing sugar as you need to create a frosting that’s of piping consistency (this means it will hold its shape when piped on top of a cupcake). Add the remaining icing sugar 1/2 cup at a time, and don’t forget to add in the pinch of salt too (this tones down the sweetness of the frosting just a bit). Once the frosting is complete and the cupcakes have cooled completely to room temperature you can go ahead and frost the cupcakes however you like! Because this frosting is so fluffy and soft because of the addition of the strawberries, I chose to pipe the frosting on each cupcake in a circular motion using a medium plain round tip. If you prefer the look of a star tip or any other style, go ahead and use that. It’s up to you! Finish off each cupcake by nestling a fresh, ripe strawberry into the top of the frosting (I used Driscoll’s Organic Strawberries). Don’t they look gorgeous?? 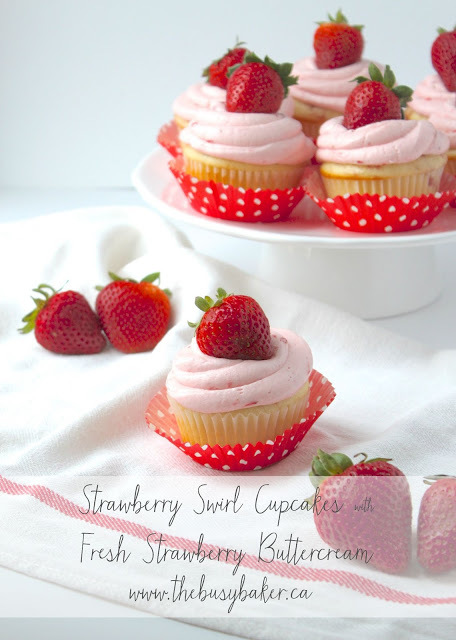 These cupcakes just scream summer – they’re sweet and light-tasting (make no mistake, they are not diet cupcakes…as if you needed me to tell you that) and they’re the perfect opportunity to show off some beautiful, fresh summer strawberries. And there’s a fun surprise inside! 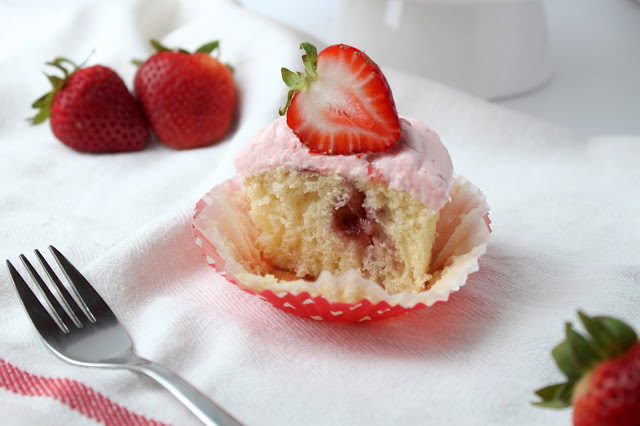 The strawberry jam swirled into each strawberry cupcake adds another layer of sweetness and strawberry flavour! Looking for more easy strawberry recipes? Make some Strawberry Cheesecake Fruit Dip or a batch of delicious Strawberry Hand Pies! 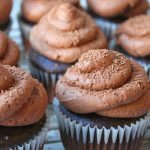 These cupcakes are 13 Weight Watchers PointsPlus each, which definitely doesn’t make them the healthiest dessert you’ll eat this summer, but they’re perfect for a special occasion and even better for sharing! These cupcakes are the perfect summer dessert. Bright and flavour-packed with fresh strawberries. 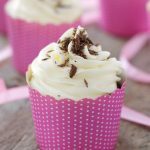 You'll love this easy cupcakes recipe! 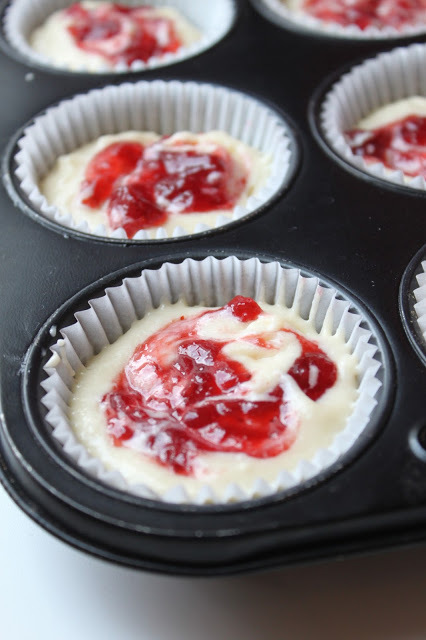 Preheat oven to 350 degrees Fahrenheit and line cupcake or muffin tins with 18 paper liners of your choice. 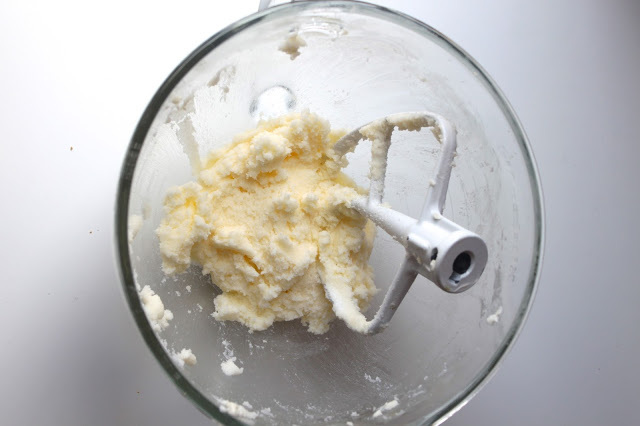 Next, start preparing the cupcake batter by adding the butter and white sugar to the bowl of a stand mixer. Beat the ingredients together on medium-high speed for several minutes, until the mixture becomes light, fluffy and pale in colour. Beat in each of the 5 eggs, one at a time, on medium speed, stopping between each addition to scrape down the sides and the bottom of the bowl to make sure everything is incorporated evenly. Measure the flour, baking powder and sea salt into a separate bowl and set it aside. Measure out the milk and add the vanilla to it. Add the dry ingredients and wet ingredients alternately, starting and ending with the dry ingredients. Add the ingredients on the lowest speed and be careful not to over mix...only let the mixer run until the ingredients are just combined. Add the last addition of dry ingredients by hand with a rubber spatula just to prevent over mixing, which leads to a tough and dense crumb. Divide the batter evenly between the 18 paper liners, filling each about 3/4 full. 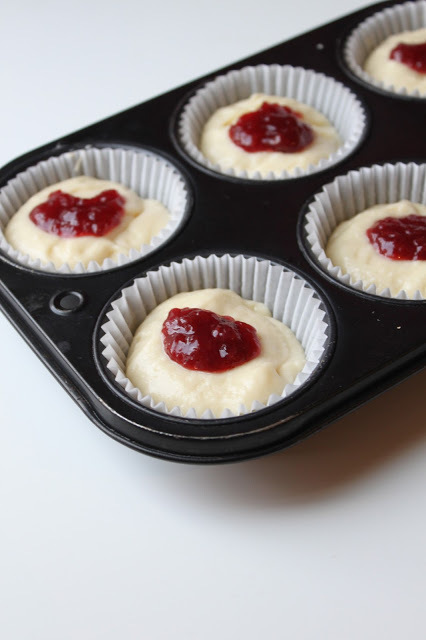 Measure out one teaspoon of strawberry jam onto the top of each well of batter. 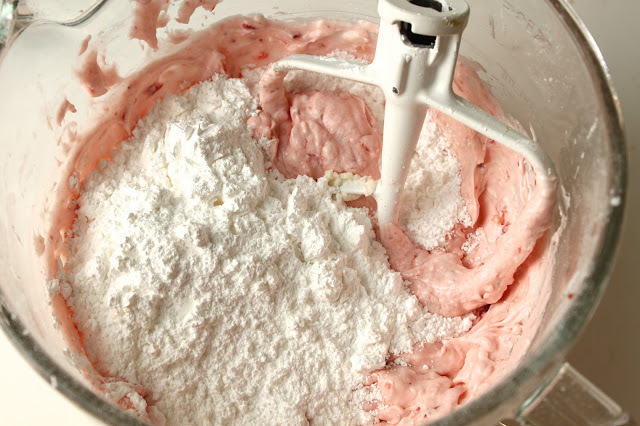 Using a butter knife, cut into the jam and swirl it around in the top half of the batter. Place pans in the oven and bake at 350 for 18-20 minutes. Remove pan from oven and wait 2 minutes, then remove the cupcakes from the pan and let them cool completely on a wire rack. While you're waiting for the cupcakes to cool you can begin to prepare the frosting. 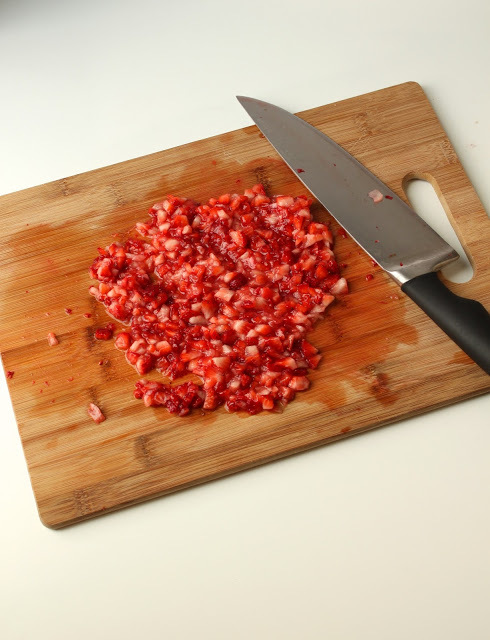 Chop 5 or 6 strawberries as finely as you can. You'll need to add 1/2 cup chopped fresh strawberries to the frosting, but once they've been chopped, add the strawberries to a strainer over a bowl to let the excess liquid drain out of them while you prepare the rest of the frosting. Add the butter and 4 cups of icing sugar to the bowl of your stand mixer, along with the milk. It's a good idea for the butter to be just slightly cooler than room temperature for this frosting because of the high water-content in the strawberries. Beat the butter, icing sugar and milk on high speed until you end up with a stiff buttercream frosting. You'll probably have to scrape down the sides of the bowl a few times to make sure everything is incorporated. Measure out 1/2 cup of the drained strawberries and add them to the stiff frosting. Beat them in on medium speed, scraping down the sides of the bowl to make sure everything is evenly incorporated. At this point, your frosting may be too soft to pipe, so add as much of the remaining 2 1/2 cups of icing sugar as you need to create a frosting that's of piping consistency (this means it will hold its shape when piped on top of a cupcake). Add the remaining icing sugar 1/2 cup at a time, and don't forget to add in the pinch of salt too (this tones down the sweetness of the frosting just a bit). Once the frosting is prepared and the cupcakes have cooled completely to room temperature, you can go ahead and frost the cupcakes however you like! Because this frosting is so fluffy and soft, I chose to pipe the frosting on each cupcake in a circular motion using a medium plain round tip. If you prefer the look of a star tip or any other style, go ahead and use that. It's up to you! 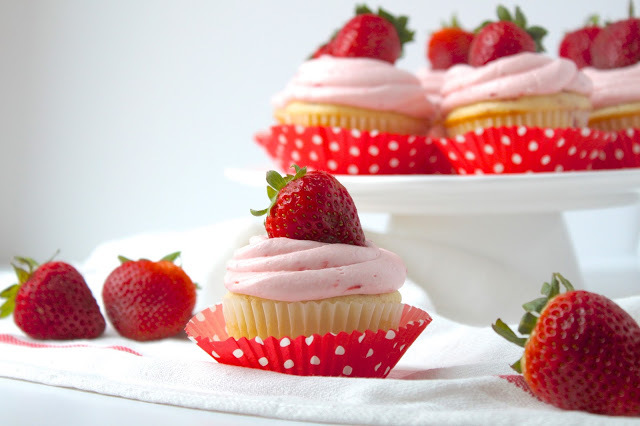 Finish off each cupcake by nestling a fresh, ripe strawberry into the top of the frosting. 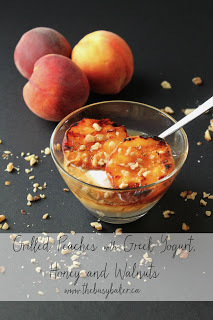 I hope you enjoyed this recipe along with the other two recipes in my #SummerDesserts series this week! Check them out by clicking on the photos below! Wow..your pictures look amazing…and so do the cupcakes. I just want to eat them up!! I love your pictures! They are fantastic! And the fresh light flavours of your cupcakes are amazing!! Love strawberries!! Wow, these look amazing!! I love that you added fresh strawberries to the batter. Thanks Pam 🙂 I'm sure thankful for my little helpers! so cute and gorgeous, love the step by step photos. I use to hate cake/cupcakes. I realized it is because everyone was making them with pre-made ingredients. These from scratch , fresh strawberry cupcakes look perfect to me. These are adorable, right down to the cupcake liners! 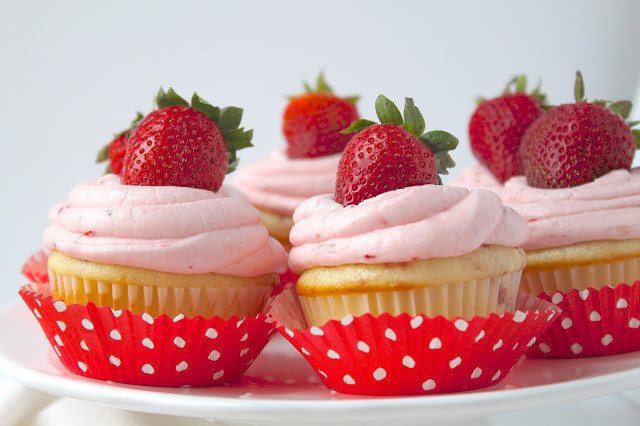 Love the strawberry throughout the cupcake. Looks great. I love strawberries and I love cake! The combinition of these two is definitely something that I'd love to try my hand at soon! Very pretty cakes! These are sooo cute! A decadent way to eat strawberries! My daughter loves making cupcakes I think we will be making these very soon, I love how you swirl the frosting. Gorgeous photos. 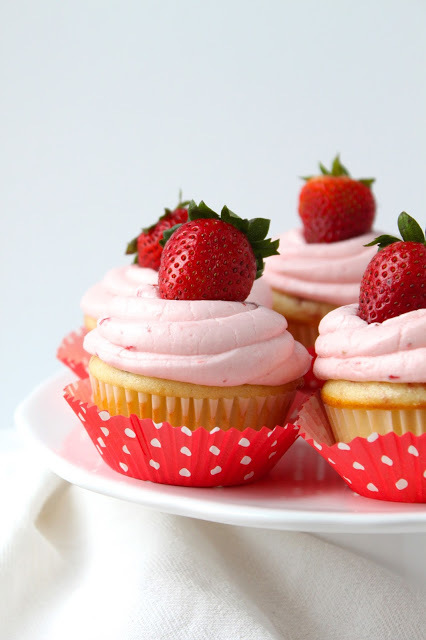 I love strawberry ANYTHING, and these cupcakes look so mouthwatering! I love your photography and the step by step pictures. Keep it up 🙂 It's all beautiful!! Chrissie, Can have dessert together? I vote you bring these! They just look so cute! 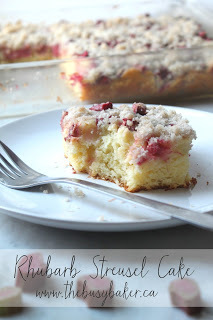 I love the swirled jam surprise inside and the fresh berries in the frosting! Nice work! Nice article, we will try to make this cake on this saturday at my sister’s birthday. This cake is well decorated and looking very tasty, Its recipe is also very simple. Today I will make it. 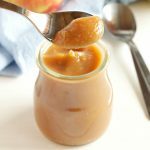 What brand of strawberry jam did you use in this recipe. 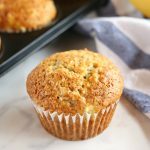 Hello, I’ve been looking for a from scratch strawberry cupcake recipe. This looks really delicious. I was wondering if it would be ok to add a little pink food gel. Also do you swirl only or can you add the strawberries to the batter? Adding pink colour would be just fine! I’d recommend red, rather than pink, as this will give a subtle colour that resembles actual strawberries. And I would suggest swirling only, so as not to change the texture of the cupcake itself.